Our premium grade Australian made pillow and mattress protectors help your mattress and pillows stay fresher and cleaner for longer whilst protecting your bedding from general wear-and-tear. 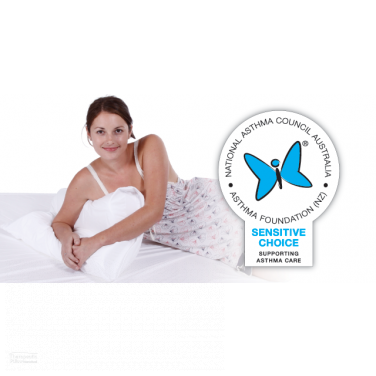 The Eucalyptus Mattress Protector and Fibre Pillow Protector are hypoallergenic and are ideal for people who suffer from allergies. Our mattress protector helps your bed stay cool, dry and soft on the mattress top helping regulate sleeping temperatures and reducing bacterial growth. At Pillows Australia, we are proud to supply a specially selected set of natural Australian made hypoallergenic Eucalyptus Pillow and Mattress Protectors. Our protectors are completely made and designed in Australia by working closely with Australian health care practitioners and Australian families and by sustaining the world leading health and well being standards that Australia continues to uphold. Our set of natural Eucalyptus pillow and mattress protectors dynamically fit to beds and pillows of all different sizes. The mattress protectors we offer are made to fit mattress sizes including a king size mattress, queen size mattress, double or futon mattress, single mattress and a king single mattress. Our mattress protectors are designed to prolong the life of your bed, from your mattress up to your sheets, the natural eucalyptus fibre protectors help prevent wear-and-tear from general use. Our bodies are a marvellous master piece of natural creativity that essentially enable us to enjoy and experience our day-to-day lives. As strong as they may be, our bodies are fragile frames that are vulnerable and often victim of physical pains, aches and debilitating conditions. Many typical daily activities like sitting at the office all day, sleeping incorrectly and undertaking strenuous exercise can unfortunately cause the body a range of physically damaging issues. Often, and generally without warning, our bodies fall victim to a range of physically debilitating conditions, such as the excruciatingly painful back pain caused by sciatica or a slipped disc, lumbar pain from lower back muscle tension, lower back pain and tailbone pain from coccyx injuries and pelvic conditions, and neck and shoulder pain associated with upper back conditions like scoliosis and irregular spine alignment. All of these conditions are are exhausting and painful at the best of times, making it all but impossible for our bodies to function at the peak of their physical and mental capabilities. With this in mind, we have made it our primary goal at Pillows Australia to help people find the best support and comfort that their bodies need and that their bodies deserve. Our specially selected set of Mattress and Pillow Protectors have been carefully designed to give your bed the best protection from wear and tear year on year. Whether it be a king single, queen or full size king mattress bed, our natural eucalyptus mattress protectors give your bed the best protection against regular everyday use. The accompanying natural eucalyptus pillow protector works just as effectively as it’s mattress counterpart, giving your pillow long-lasting protection from bed sheet friction and general use. From our Mattress Toppers to our Pillows, and of course our mattress and pillow bedding protectors, all of our products are created to enrich the health and well being of Australians and people around the world. Rest Better, Sleep Better, Be Better.